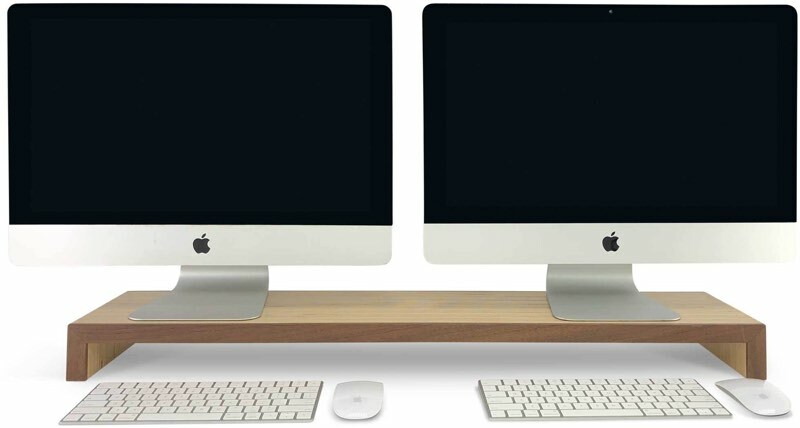 For this week's giveaway, we've teamed up with Understands to offer MacRumors readers a chance to win a high-quality iMac stand or shelf made from wood. Understands makes a selection of stands, shelves, and drawers that are designed to accompany the iMac, though there's potential for these to also work with other computer monitors. Each stand is made entirely from salvaged urban wood, with different options like ash, walnut, and cherry available. The Evo, priced at $99 to $129, features an iMac undermount, so it adds storage to the area above your iMac's stand while also raising it to an optimal viewing height. 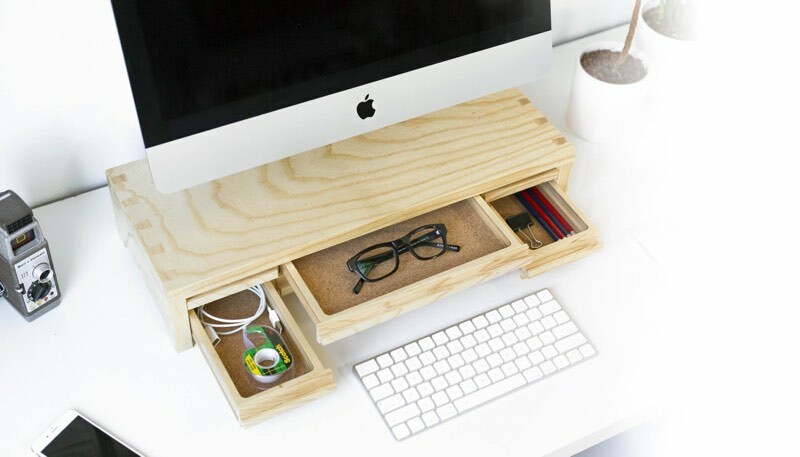 It is available with or without a drawer, and there's space to store the Apple Magic Keyboard underneath it. 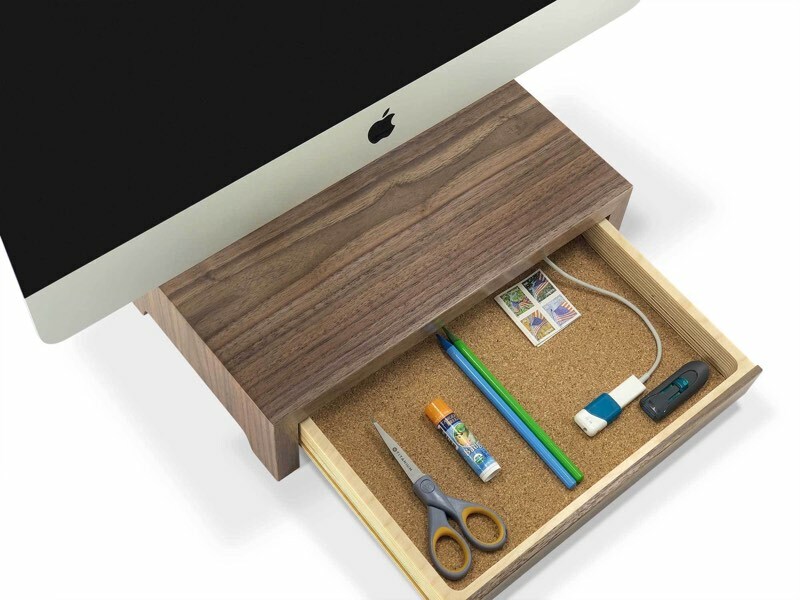 At the back, there are cutouts for cords, which allow them to be routed into the drawer for storing and charging devices like iPhones and other peripherals. Priced at $300, the Planet features a total of three cork-lined drawers for holding accessories and peripherals, with one additional hidden drawer and built-in hand-cut dovetail joinery. The Planet, made from ash harvested sustainably in Illinois, is also an undermount design that fits over the iMac's stand with rear-facing cutouts for managing cables. Made from birch with walnut trim, the Bolt comes in multiple sizes and can hold a single monitor/iMac or multiples. The Bolt stands are 9 inches deep and have customizable height options ranging from three to five inches. Prices range from $49 for a nine-inch single iMac version to $119 for a 42-inch model. 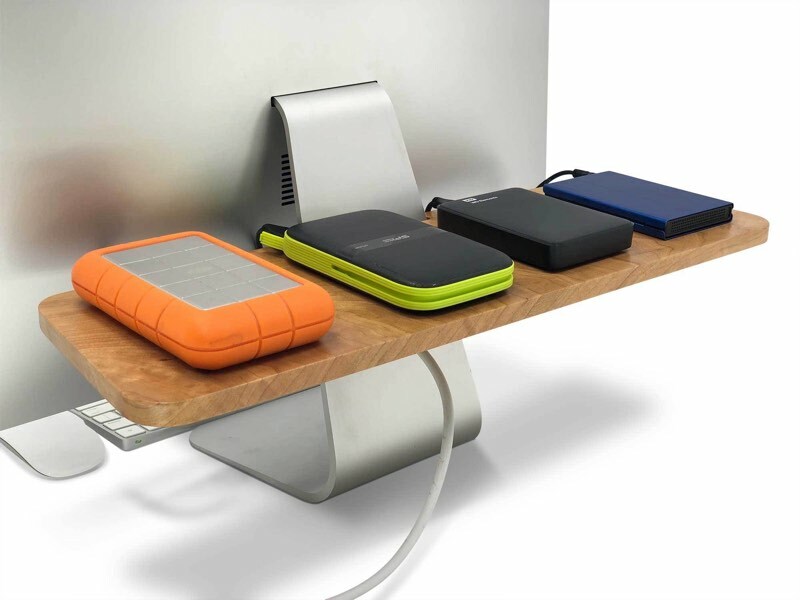 The Butler is a little shelf that's designed to fit on the back of the iMac where it can hold storage devices and other knick knacks. It's an ideal place to put your SSDs and hard drives because it keeps cables out of the way. There are multiple wood options for the Butler, along with 15 and 20-inch size configurations. The Butler is priced from $59 to $79. Priced at $189, the Ray is another iMac stand with an undermount design that raises the iMac up to an ideal viewing height. It features a pen tray, a large cork-lined main drawer big enough to hold an iPad, and space underneath to put the Apple Magic Keyboard. As with other Understands options, there's built-in cable management with felt cable grips so you can hide your cords away. For our giveaway, Understands is offering MacRumors readers a chance to win one of four $400 gift cards that can be used to purchase anything on the Understands website. To enter to win, use the Rafflecopter widget below and enter an email address. Email addresses will be used solely for contact purposes to reach the winners and send the prizes. You can earn additional entries by subscribing to our weekly newsletter, subscribing to our YouTube channel, following us on Twitter, following us on Instagram, or visiting the MacRumors Facebook page. a Rafflecopter giveawayThe contest will run from today (November 9) at 11:45 a.m. Pacific Time through 11:45 a.m. Pacific Time on November 16. The winners will be chosen randomly on November 16 and will be contacted by email. The winners will have 48 hours to respond and provide a shipping address before new winners are chosen. Impressive that some dude was able to start a business based entirely around creative use of plywood scraps. Wish I’d thought of that. Love your adventure with compressed wood dust furniture - IKEA's forte! I had a similar desk with hutch (Saunder) in the early 90's, new to furniture buying. We put it together, it was fine then had to move - snap! Put it back together just like you described, but knew we were going to move many more times (apartments) before settling down! :eek: Found a friend who was settling in a big home, donated it and warned them not to move it around. 23 years later, it is frozen in place and doing its job very well. Never bought furniture that is not solid wood or plywood since. Scared me off of IKEA forever after I found out their basic "wood". iMac already sits high and needs no stand - "stands" that provide under-monitor storage are okay but not at these prices. Prefer steel mesh desktop storage units, convenient and color schemed. Sauder is actually one of the better brands, from what I’ve seen. Our entertainment center bought at the same time as the hutch desk from Hell is a Sauder and still going strong with no damage after being moved through 4 different homes. The desk is a Bush or Busch, if I remember correctly. I have some IKEA furniture and it’s horrible. But the all-wood IKEA shelves are okay. We started out so broke and worked so many hours, there was no time to shop at flea markets for cheap but real wood furniture. We went for the cheapest stuff we could fling to the cashier on a day off and figured we would replace it all with nice things someday. Years passed and we became parents and decided we would replace the cheap stuff when kids were no longer crashing their trikes into it. We got rescue animals, too, and the idea of new furniture seemed even more like folly. By the time we reached a point in life we could afford the really good stuff, we realized it would be time to downsize in just a few years. Doh! Plus we have now found years of memories invested in this “crap stuff” that somehow managed to survive and even flourish way past all expectations. Instead, we’ve helped cousins and nieces and nephews and their kids get a slightly more fancy start at married life than we did. Just slightly. They’re running into the same issue we did with toddlers and dogs making them want to delay purchasing much of anything too fancy. FYI, we don't use your email address for anything other than notifying winners, so if you're getting emails, the giveaways aren't the source. Wow, these look really nice. Doesnt matter what it is or does or how it does it. Internet People don't even have to consider it to know they hate it and could do it better themselves, if only they had some tools and some materials and some time and energy and weren't so busy opining on the internet. What a junk lineup of unnecessary products! Regular tables already exist; accessaries included. 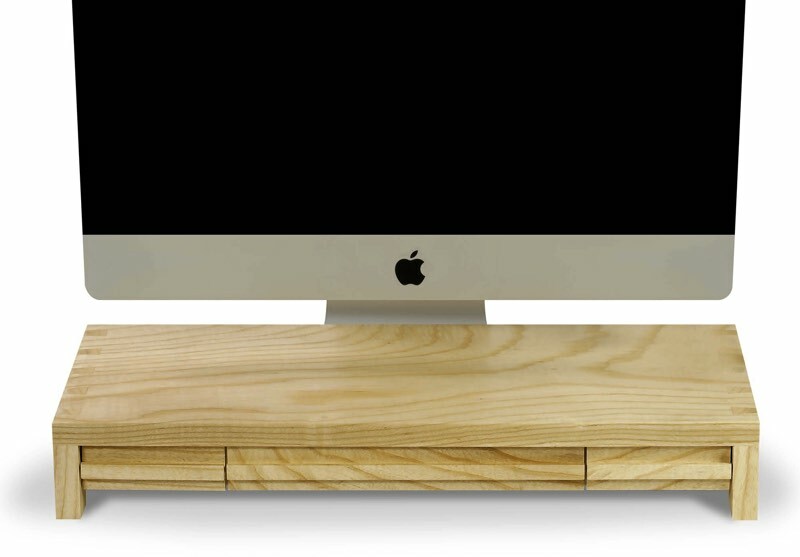 Wood with an iMac looks completely anachronistic. Those shelves look completely out of place IMO. 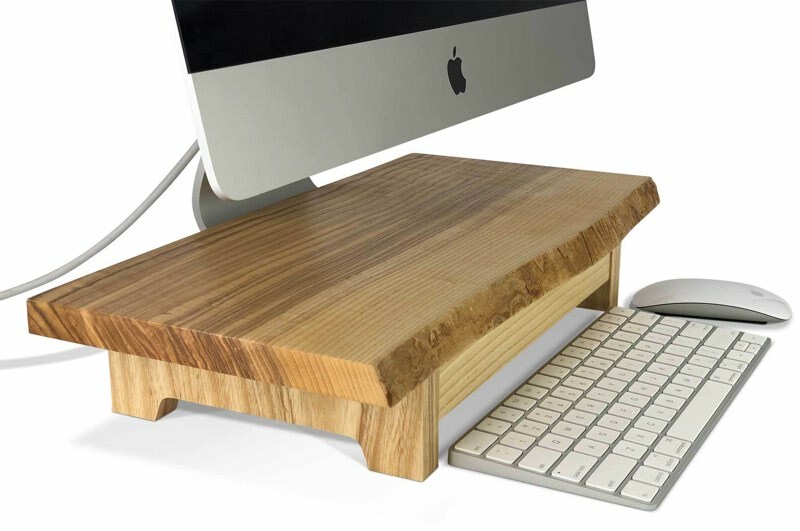 For this week's giveaway, we've teamed up with Understands ('https://understands.com') to offer MacRumors readers a chance to win a high-quality iMac stand or shelf ('https://understands.com/collections/welcome-to-your-new-desk') made from wood. To enter to win, use the Rafflecopter widget below and enter an email address. Email addresses will be used solely for contact purposes to reach the winners and send the prizes. You can earn additional entries by subscribing to our weekly newsletter ('https://my.leadpages.net/leadbox/145ef7173f72a2%3A104a9fa76b46dc/5754903989321728/'), subscribing to our YouTube channel ('//www.youtube.com/user/macrumors'), following us on Twitter ('https://twitter.com/macrumors'), following us on Instagram ('https://www.instagram.com/macrumorscom/'), or visiting the MacRumors Facebook page ('https://www.facebook.com/MacRumors'). Due to the complexities of international laws regarding giveaways, only U.S. residents who are 18 years or older and Canadian residents (excluding Quebec) who have reached the age of majority in their province or territory are eligible to enter. To offer feedback or get more information on the giveaway restrictions, please refer to our Site Feedback section ('https://forums.macrumors.com/threads/macrumors-giveaways-why-are-they-only-open-to-u-s-residents.1918337/'), as that is where discussion of the rules will be redirected. The contest will run from today (November 9) at 11:45 a.m. Pacific Time through 11:45 a.m. Pacific Time on November 16. The winners will be chosen randomly on November 16 and will be contacted by email. The winners will have 48 hours to respond and provide a shipping address before new winners are chosen. Dang. Wish my drawers could stay that organized. Boxers or briefs :) ? The stand looks great and it's nice to have a non-iPhone accessary give away. That sounds like a breach. Someone at MR should follow up with you about that. Maybe it's only because I keep moving, but I've settled on having just a table as my desk. Sure I have to be a little more selective about what I put there, but in the end I shouldn't need much. And it would look ugly except that my Mac Pro setup is nice enough to distract from it.